Man, do I hate saying that. As I’ve explained before, I hate the phrase “great time to buy,” for a couple of reasons. First, people have different needs, and a market that’s great for one person might be terrible for another person. Second, while markets tend to move together, we do see micro-markets (i.e., towns and villages) that defy larger trends. So while it might be a great time to buy in Village A, it might be not so great in Town B. Third, and most importantly, though, “it’s a great time to buy!” just seems like a hack thing to say, the kind of thing that TERRIBLE real estate agents have said for generations to get unsuspecting and gullible people to buy an overpriced home. And I think that most people get suspicious when real estate agents talk like that. So I understand if you’re skeptical. And that’s why I don’t want to just TELL you it’s a great time to buy, I want to SHOW you why it’s a great time to buy. 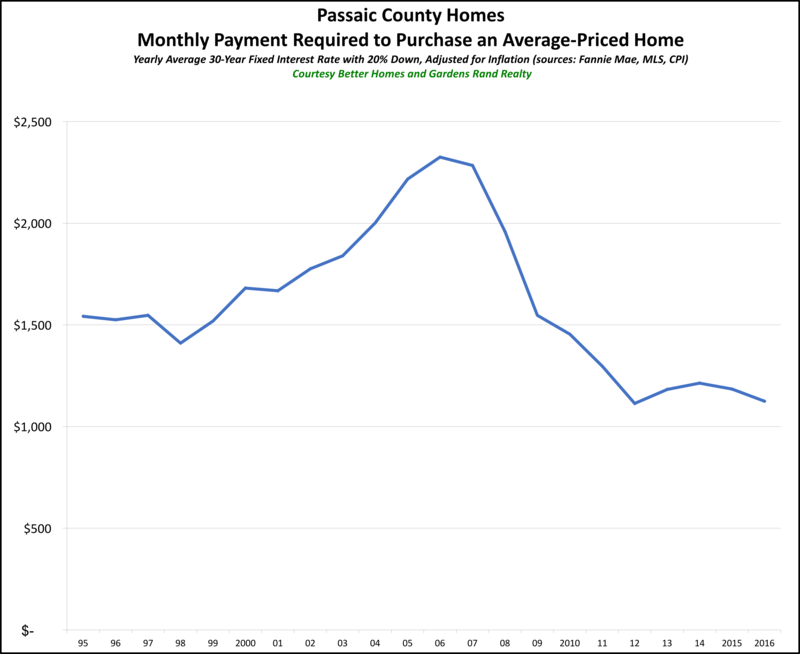 Specifically, I want to make this specific point: the monthly payment you need to buy an inflation-adjusted average priced home in Northern New Jersey is as low as its been in a generation. Think about what I’m saying for a second. I’m NOT saying that homes are cheaper than they’ve ever been. That’s not true. Depending on the year, homes have appreciated, and if you go back more than 15 years, they’ve appreciated pretty dramatically. I’m just saying that the MONTHLY PAYMENT you need to make to buy the AVERAGE PRICED HOME is lower right now than it’s been in a generation — if you control for the effects of inflation. •The average price of a single family home up to the end of 2016 – from the local MLS data. •The average interest rate for a 30-year fixed-rate mortgage for every calendar year up to 2016 – from Freddie Mac. •The prevailing inflation rate for every calendar year up to 2016– from the US Department of Labor. You can see the results on the graph. 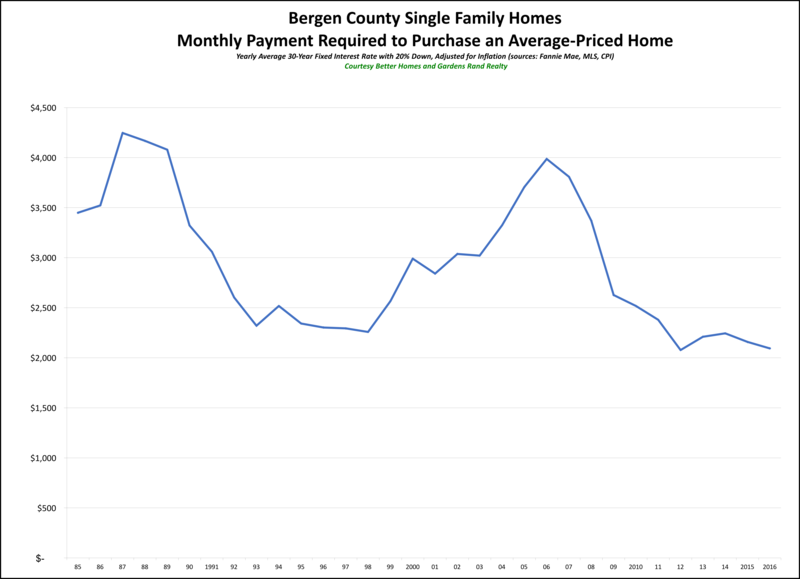 The monthly payment you have to make to purchase the average-priced home in Bergen or Passaic is just about as low as it’s been in years. We saw the slightest uptick from 2012-2014, partially because of a slight increase in pricing and a slow inflating of interest rates. But the payment came down again over the past two years, with rates falling and prices stalling. Generally, though, we’re talking about a monthly payment that is as low as anytime in the past 30 years – and as low as it was in the mid-1990s, during a crippling buyer’s market. We don’t have data going back in Passaic as far as we do in Bergen, but there’s no reason to think that the markets behaved differently during the 1980s. 1) Prices. Part of it is that we have not seen prices go up in any measurable way in almost 10 years. Home prices peaked in 2006-08, lost about 25-30% of value from 2008-2010, and have bounced around a little since then. But they’re still around 2004 levels — without controlling for inflation. 2) Inflation. Ah, yes, inflation — the value of money goes down a little bit each year as inflation takes a bite. Now, inflation rates have been pretty low over the past 15 years from historical standards, but that little bit each year does add up. 3) Rates. But the biggest reason we’re seeing monthly payments lower than they’ve been in a generation is that rates are still at historic lows. After all, about ten years ago, the average interest rate was about 6%. For the past few years, it’s been below 4%. That’s a huge difference in your monthly payment. Again, I HATE it when real estate professionals say that “this is a great time to buy,” because at many times in our history that has been bad advice. But if you measure a “great time to buy” by looking at the monthly payment you’ll have to make to buy a home, then we’re talking about as good a time to buy as any in the past decades. Prices have been flat for almost 10 years, and they’re down significantly if you factor in the effects of inflation. And interest rates are still as low as we’ve ever seen them. Unless we see some major shock to the economy, I think we’re looking at a near-decade of reasonable price appreciation coupled with increasing interest rates – both of which are going to drive that monthly payment up over the next few years. Joe Rand is the Chief Creative Officer of Better Homes and Gardens Real Estate | Rand Realty, and compiles and writes the Rand Quarterly Market Report. Homes in Northern New Jersey Are Cheaper Than They’ve Been in a Generation! Homes in Northern New Jersey Are Cheaper Than They've Been in a Generation! The average price of a single family home up to the end of 2016 – from the local MLS data. The average interest rate for a 30-year fixed-rate mortgage for every calendar year up to 2016 – from Freddie Mac. The prevailing inflation rate for every calendar year up to 2016– from the US Department of Labor. Prices. Part of it is that we have not seen prices go up in any measurable way in almost 10 years. Home prices peaked in 2006-08, lost about 25-30% of value from 2008-2010, and have bounced around a little since then. But they’re still around 2004 levels — without controlling for inflation. Inflation. Ah, yes, inflation — the value of money goes down a little bit each year as inflation takes a bite. Now, inflation rates have been pretty low over the past 15 years from historical standards, but that little bit each year does add up. Rates. But the biggest reason we’re seeing monthly payments lower than they’ve been in a generation is that rates are still at historic lows. After all, about ten years ago, the average interest rate was about 6%. For the past few years, it’s been below 4%. That’s a huge difference in your monthly payment.